Located at a height of 17,000 ft, the journey and the destination defy description. The 7-8 hour journey from Gangtok is through lush greenery and waterfalls as one reaches the Lachen village, which is the base for this trip. The excursion toÂ GurudongmarÂ begins with a 4-5 hour drive through snow clad peaks and mountains till one reaches theÂ Gurudongmar Lake. 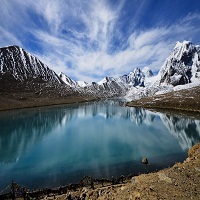 Amongst the top 15 highest lakes in the world it is the second highest lake in Sikkim as well as in India, the first being Cholamu lake at a height of 18000 ft, also situated in Sikkim.Â Â Being the second highest lake in India, the panoramic and scenic beauty of the place is a sight to behold. Named after Guru Dongmar, the lake has a religious appeal.Â Â The view of Mount Siniolchu and Khanchendzonga is breathtaking from that point. The beauty of the lake is awesome and out of the world spectacle. Surrounded by snow clad mountains and crystal clear icy water, it is considered to be a very sacred lake. The water ofÂ Gurudongmar LakeÂ are said to have curative properties and many tourists carry the water with them on their way back.Â Â Close to the lake, there is a 'Sarva Dharma Sthal', and as the name suggests, itâ��s a place of worship for all religions. TheÂ Yumthang ValleyÂ orÂ Sikkim Valley of Flowers sanctuary, is a nature sanctuary with river, hot springs, yaks and grazing pasture on rolling meadows surrounded by theÂ HimalayanÂ mountains in theÂ North SikkimÂ district ofÂ SikkimÂ state inÂ India. It is at an elevation of 3,564 metres (11,693Â ft) aboveÂ mslÂ at a distance of 150 kilometres (93Â mi) from the state capitalÂ Gangtok. It is popularly known as 'Valley of Flowersâ��Â and is home to theÂ Shingba Rhododendron Sanctuary, which has over twenty-four species of theÂ rhododendron, the state flower. The flowering season is from late February and to mid June, when countless flowers bloom to carpet the valley in multicolored hues of rainbow. AÂ tributaryÂ of theÂ river TeestaÂ flows past the valley and the town ofÂ Lachung, the nearest inhabited centre. Yumthang is closed between December and March due to heavy snowfall. There is also a hot spring in the valley.